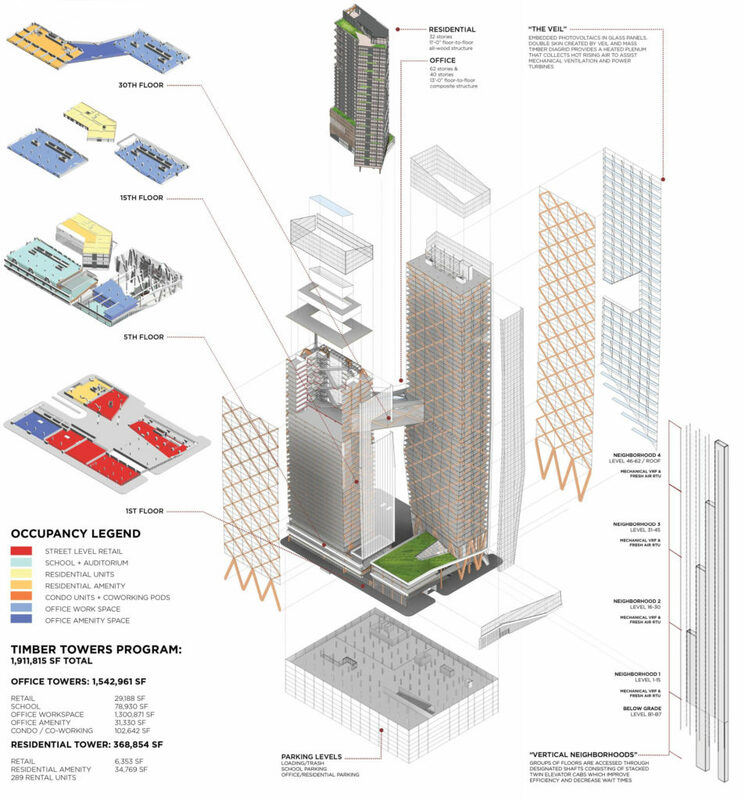 The Timber Towers Project seeks to demonstrate the viability of a mass timber high-rise, as an alternative to steel and concrete. In the process of designing a new landmark on Philadelphia’s skyline, we wanted to challenge people’s perception of what is possible with the material of wood. We’re honored to have recently been shortlisted in the Skyhive Skyscraper Challenge (view submission) which encouraged participants to re-imagine the role of the skyscraper in the future. Our team believes that in an era of depleting resources and rising carbon levels, cities will turn to wood as a reliable alternative to concrete and steel in order to tackle the challenge of climate change. 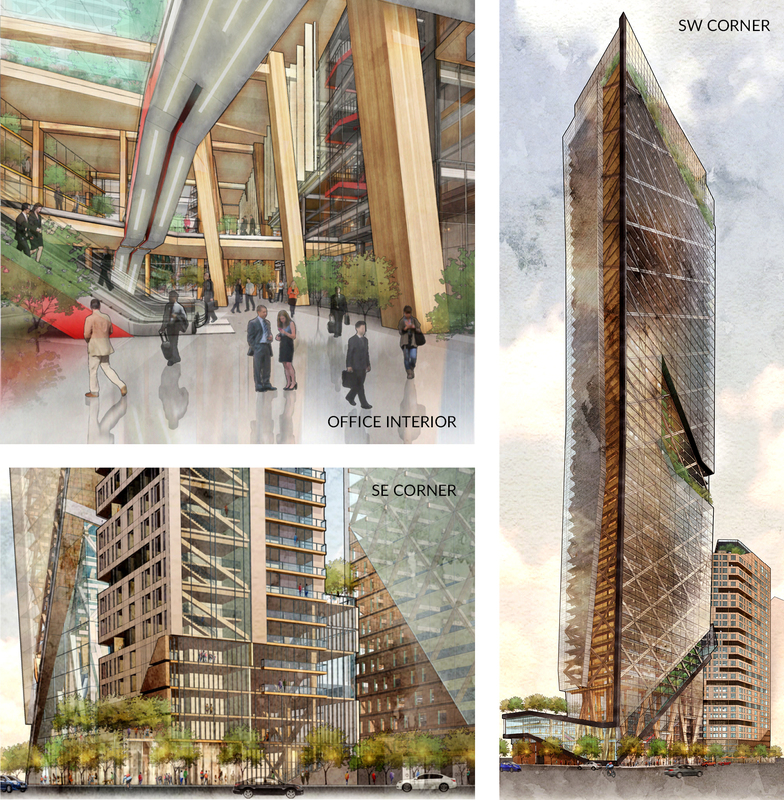 Cross-laminated timber technology, coupled with innovation in vertical transportation and mechanical ventilation, has provided designers with the ability create tall wood buildings that can remove carbon from the atmosphere, resulting in a biophilic work environment. Our skyscraper’s program consists of two office towers linked by a connecting bridge, as well as a residential tower, school, and ground floor retail. 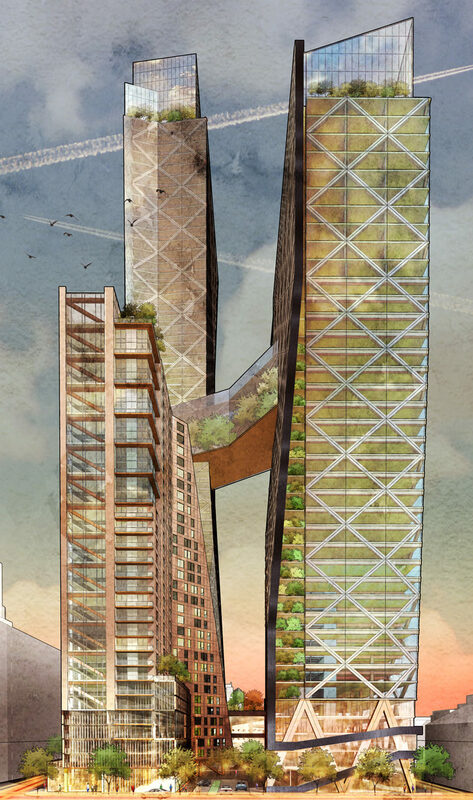 The Timber Towers in Center City Philadelphia will showcase the possibilities of building tall with wood. 58,761 m3 of wood products, easily replenished by North American forests in less than 3 hours. 73,278 metric tons of CO2 would be sequestered in wood. Total emissions savings are the equivalent to taking 12,073 cars off the road for an entire year. Cities have built skyscrapers using steel and concrete for over a century. They are iconic signiﬁers of innovation and prosperity, and yet the extraction of the building materials has been incredibly harmful to the environment. Therefore, the time has come for developers, architects, and policy makers to return to wood, the only truly renewable material that we have on earth. Team: Sean McTaggart, Rosa Zlotkovsky and Tony Maiolatesi with special thanks to our partners at Arup. Rendering assistance from Caroline Meyer.